Late last year I made the decision to buy the designer pack of EPiC yarn. It’s 100% wool and it’s useful for a lot of applications, including: tapestry weaving and band-weaving. 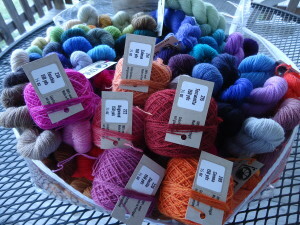 I’ve been looking for a yarn in a price range so I could afford some of every color. This satisfies my need (ok, desire – don’t judge me) to have a pallet to both weave from and build upon. 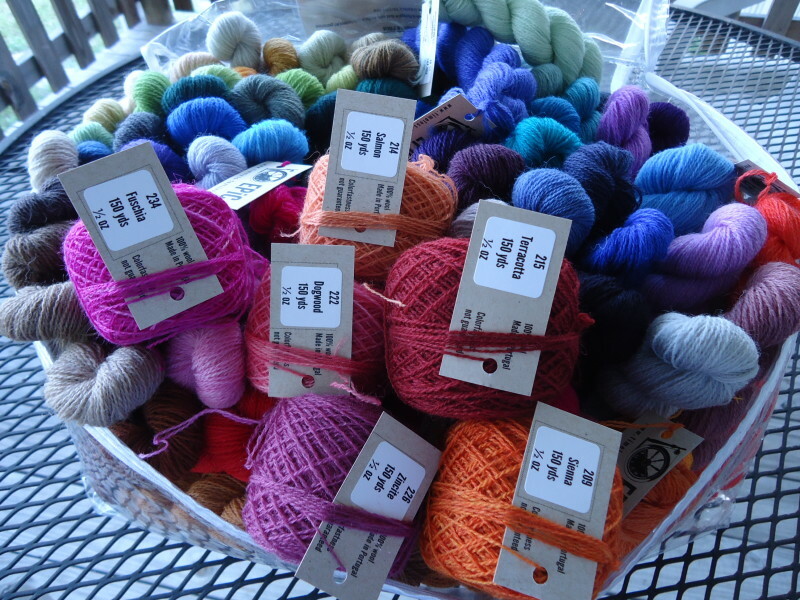 I plan to buy larger skeins of yarn as I use the smaller ball. I won’t limit myself to buying only EPiC; I plan to buy from EPiC , Norsk Fjord Fibers, and perhaps a few others. Now, I’ve finally wound all my skeins into center-pull balls and I’m itching for a project to use some of this wonderful yarn. I’ve woven mostly with a warp sett of 8 epi (ends per inch), but I want to weave in a tighter sett at times for more detail. Before I begin a project, I want to try some of this yarn to get a feel for it, and figure out how many strands I should fit into each weft bundle. In any weft-faced weaving, or a weaving where only the weft is visible, there’s a relationship between the thickness of the warp, the space between the warps (sett), and the thickness of the weft. If the weft is too thin, you can weave and weave and weave with very little progress. 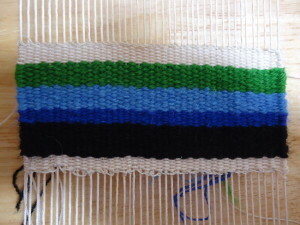 On the other hand, if the weft is too thick, you lose detail, and have difficulty covering your warp completely. The weft doesn’t have to be the perfect thickness, you can bundle multiple strands to get the correct thickness. Using weft bundles allows color combinations and blending not possible with single weft strands. The only way to know how many strands is enough, is to sample – so sample I did. 12/6 cotton Seine at 8 epi, 4″ of warp to sample EPiC yarn. I have two small looms I built from needlework/stretcher frames, one for a sett of 8 epi, and the other for 5/10 epi. I warped both of these looms with 12/6 cotton seine twine. I quickly realized, if I want to work with a sett tighter than 10 epi, I would need a warp finer than 12/6. Typically, you can start guessing how many strands by holding them up to the warp and comparing them to the space between the warps – since this is the space they’ll occupy. When I first considered purchasing EPiC yarn, I contacted Rebecca Mezoff, a tapestry weaver who wrote a blog that included her use of this yarn. I contacted her about weft bundles, and in her warm and helpful response, she mentioned 5 strand bundles for 8 epi. Thanks to Rebecca, I had a good place to start. When I hold up the 5 strands of yarn twisted together, it looks like a good fit to me. I decided not to get carried away mixing colors in bundles; I really want to see how this yarn beats down and covers the warp. I did however do some hatching – I couldn’t help myself. Initially, I was going to try 4, 5, and 6 strand bundles, but I tried the 5 bundle first. There was no need for me to try anything else, 5 strands is perfect. I got perfect coverage and the hatching looks good. The yarn beat down exactly the way I wanted, and it didn’t get too lofty or spring back up. First sample done. 5-strand bundles for 8 epi. 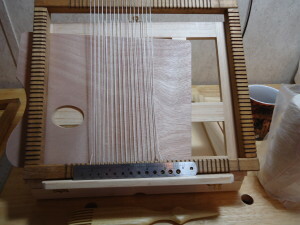 Next, I went to work on the loom I warped at 10 epi – my target sett. I thought, 4 or maybe 3, but probably not 2 per bundle. When I twisted 3 wefts together, they looked pretty good in the warp space. 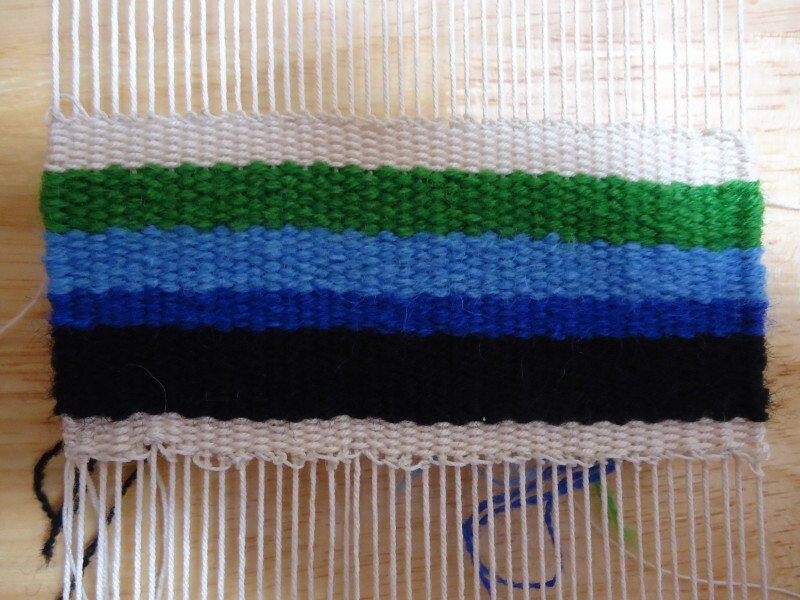 I wove a band of black and one of dark blue. It covered the warp great, but I thought I would be remiss if I didn’t at least try a bundle or two of 4. I wove a band of light blue and green with 4 strands to a bundle. I got warp coverage, but it took an effort. 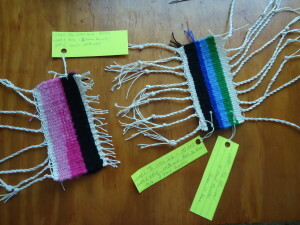 I had to give the 4-strand bundle a firmer beat, and it was more difficult to maintain the weaving width. The selvages wanted to bulge out and the weft would spring up after beating. I could see that I would likely lose some detail in a 4-strand bundle. 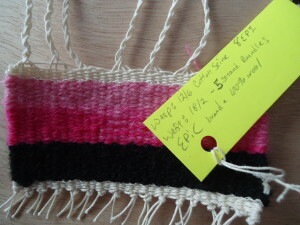 When I look at my samples off loom, I can see the warp peeking though in a couple of places on my 4-strand bundles. I think, if I weave at this sett (10 epi) with a warp thinner than the 12/6 I used for these samples, the 4-strand may work better. The space between the warps would increase and would possibly accommodate an additional strand. The only way to know for sure is to sample again with a finer warp. At this sett and with this warp (12/6 cotton seine), the 3-strand bundle worked perfect. Now that I’ve used this yarn, albeit small samples, I like it. I also think it will pair well with the yarn from Norsk Fjord Fibers. The yarns are different thicknesses, but I think they can be combined well, and substituted for each other as long as the bundles maintain the correct thickness. I have seen this yarn used for tablet weaving. I would like to explore that use some time. If I decide to try it in a warp faced weave structure, I will certainly over-spin it on my wheel to increase its twist, strength, and reduce its tooth or stickiness. That’s what I think it will take to stand up to the rigors of tablet weaving and not stick to its neighbor so much. It’s nice to have the entire pallet to choose from, and if it’s not enough, I can order a larger quantity of what I need. If I only need a tiny bit, then it’s all there. What a difference from choosing from a tiny square picture from paper or the distorted colors of a computer monitor. Even swatches leave a little to be desired. I think I may make a swatch book from the skeins, It would be nice to have at hand. It would be interesting to see how it pairs with a wool warp. Hmm, I see more samples in my future. I did get to try out my fringe twister. Surprisingly, this tool takes a bit of practice. I’m glad the practice is on a sample and not on something that needs to go to someone. Thank you, Marsha Capinera for the wonderful idea of re-purposing my algebra book. I’m getting much more enjoyment out of this book using it this way.